Bob Ainsworth MP, former Home Office drugs minister and Secretary of State for Defence, will call for the legalisation and regulation of drugs during a Parliamentary debate he is leading in Westminster Hall, at 2.30pm, Thurs 16th December 2010. "This could be a turning point in the failing UK 'war on drugs.' Bob Ainsworth is the persuasive, respected voice of the many whose views have been silenced by the demands of ministerial office. Every open rational debate concludes that the UK's harsh drugs prohibition has delivered the worst outcomes in Europe - deaths, drug crime and billions of pounds wasted." For more information on calls for an Impact Assessment of our approach to drugs see: Transform / IDPC briefing: 'Time for an impact assessment of drug policy' . Decriminalisation is the removal of criminal sanctions for the production, supply or use of an illegal drug. Civil or administrative sanctions, such as a fine or requirement to enter treatment, may remain, even if criminal sanctions (resulting in prosecution and a criminal record) are removed. In popular usage, the term 'decriminalisation' usually refers to the removal of criminal sanctions for possession of drugs for personal use, while sanctions often remain for the production or supply of drugs. We have now uploaded footage of the speakers at our 'Ending the War on Drugs' event which has held last month in London. This was a really successful event, with some great speeches from a range of people who each provided their own particular insight into the so-called 'War on Drugs'. The speakers are Angus MacQueen, award-winning documentary maker and director of the recent Channel 4 series 'Our Drugs War'; Carel Edwards, former head of the European Commission's Anti-Drug Coordinating Unit; and Misha Glenny, a specialist on Southeastern Europe and author of 'McMafia: Seriously Organised Crime'. Angus MacQueen speaking at Transform Event from Transform on Vimeo. Carel Edwards speaking at Transform Event from Transform on Vimeo. Misha Glenny speaking at Transform Event from Transform on Vimeo. Great to see yet more mainstream media coverage of the drug law reform debate, this time in a special issue of The Nation Magazine. 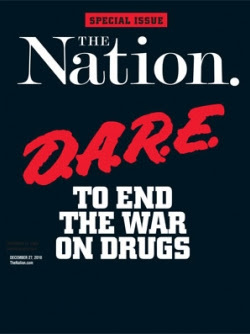 The cover story includes a visual riff on the logo of the infamous D.A.R.E drug prevention program, a gag used previously by Students for Sensible Drug Policy (SSDP is covered in one of the feature articles, by SSDP director Aaron Houston - see below). A special Nation forum, with contributions from Ethan Nadelmann, Marc Mauer, Bruce Western, Tracy Velázquez, David Cole and Laura Carlsen.